The ridiculous mod that allows folks to play with each other in Just Cause 2's map has always been wild, but now the enterprising people behind it are continuing to add features that will expand upon the madness. This 0.1.4 update, which is now in beta, will include earthquakes and wearable hats and heatseeking missiles. Oh, and cars that drive on water. Those Jesus cars would be the best thing about this update, but those hats. See, this update allows users to attach objects to other objects—like putting a hat on your character's head, but not limited to that. 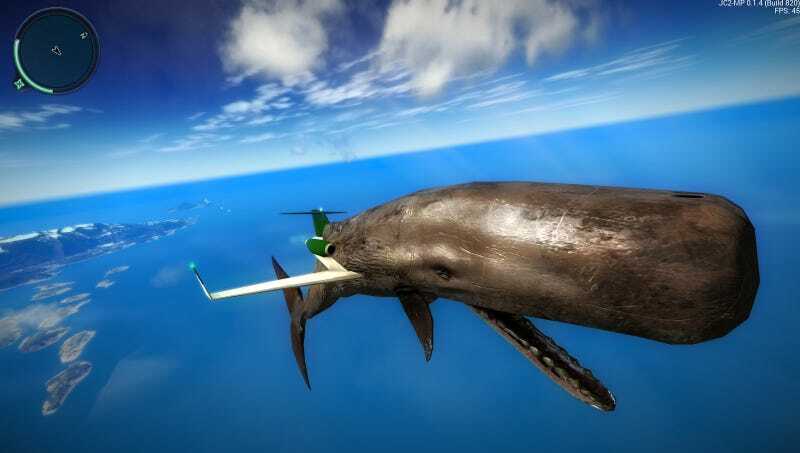 You could also, say, attach a whale to an airplane. The full changelog for this update can be found at the mod's website. The mod is distributed through Steam, so if you want to participate in the public beta release, you'll need to activate it in the Betas tab.